Today was our first full day in Kyushu, the most southern of Japan’s four major Islands. We had spent yesterday evening travelling down from Nagoya to the town of Beppu and today will be dedicated to exploring a few of the attractions this city has to offer. Beppu is well known throughout Japan as one of the kings of the onsen towns. Thanks to eight different hot spring sources the city has an amazing number of different baths of offer (sand, mud, steam etc.) and produces the largest volume of onsen water in the entire country. Apart from the hot spring baths, if you mention Beppu to someone from Japan, the famous hells of Beppu (別府地獄めぐり) would likely come to mind. The hells are closely related to the hot spring baths as they’re pretty much the same thing except the hells are far too hot to actually bathe with temperatures exceeding 100 degrees. The idea is to instead just view the bubbling ponds at the eight different locations that have each been cordoned off into touristy attractions. Between bathing and viewing we opted for the latter option and planned to visit the hells in the morning, and then perhaps visit a viewing tower, ropeway or aquarium in the afternoon. Before leaving the hotel this morning we were finally able to once again enjoy an included breakfast! We were terribly deprived the last couple of days in Nagoya. The dining area was located on the ground floor and we were surprised to find that the food quality exceeded our expectations. It was quite good! After breakfast we walked up to the Beppu railway station to catch a bus to the Kannawa district. Most (six) of the hells were located here with the other two located a little further away at Shibaseki. As far as tickets go, there’s a one day bus pass on offer for Beppu which lets you ride unlimited buses for 900 yen. We were not sure if we needed it though and in our indecision ended up catching the first bus without it; we had wasted money on a similar pass back in Kawaguchiko. The ride wasn’t long and we were soon exiting at Kannawa’s bus interchange. The interchange was pretty small and basic, on one side of the road there was a clearing for buses to pull up and on the other side there was a little waiting room/ticket counter. 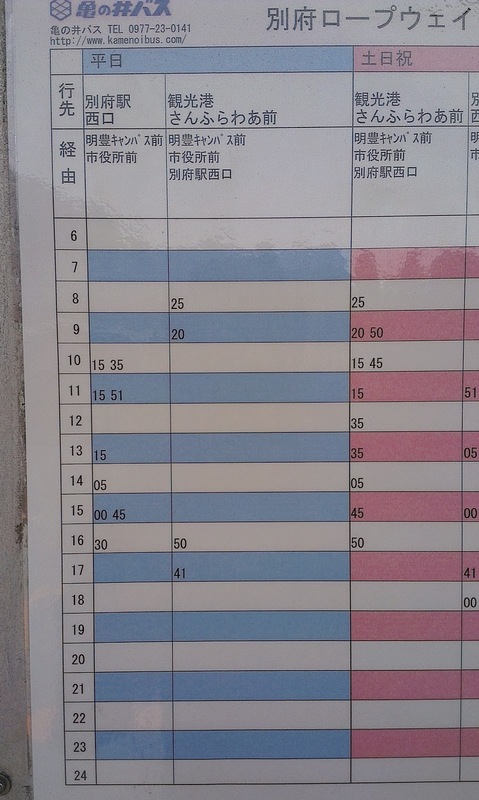 We made sure to take a photo of the timetable so we would know when to get the bus to the final two hells at Shibaseki. The hells of Kannawa were clustered up the side of a hill and we endured a decent little walk up to Kamado Jigoku which was located about half way up. The plan was to visit the three furthest towards the top first and then finish with the hell located back closer to the bus stop. This first walk up was quite interesting as the area was obviously very hydrothermally active; we saw copious amounts of steam being emitted out of cracks and pipes all over the place. Upon arriving at Kamado we went to the ticket counter and bought a pass book that would allow us to enter all the hells cheaper than what they would cost individually; even though we didn’t plan to go to all of them. This pass can be bought at any of the hells for 2000 yen. Near the entrance we came to a number of small pools that were filled with brown mud. The hot spring steam was bubbling up through the viscous slurry and making all sorts of funny shapes as the gas escaped from the mud bubbles. The hells are all set up in a pretty touristy fashion and there were a lots of statues of devils and painted display sort of things. A bit further up into this hell we came to the main attraction which was a big round and very blue coloured pond. A lot of steam was evanescing from the surface and on one side there was a large devilish looking creature stirring the pool with a big paddle. In a couple of places the steam was actually rather billowing out with some force. This pond was the cooking pot and true to the name you could actually taste the hot spring water and eat some eggs that had been boiled in the water. There was also a wall of little pipes nearby that were emitting lots of steam and were covered with lots of mineralisation. In another area we found another couple of dark red pools. Despite what I said about the water being too hot to bath in, this is (I think) one of the only hells where you can actually soak your feet. There was a special area near were you could eat the eggs for this purpose. When it was time to leave we passed through a souvenir shop that was filled with some tacky sort of goods. 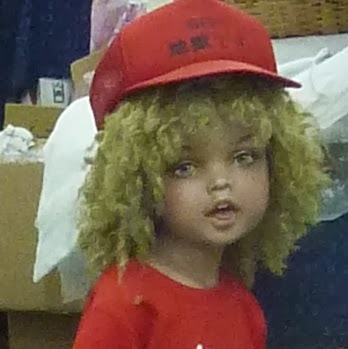 Plus a really creepy statue I for a moment through was a real cursed undead little girl. Next we continued on the Umi Jigoku (海地獄 = Sea ++ Hell) and used a ticket from our passbook to enter. The grounds of this hell consisted of a large well kept garden surrounding various hot spring and cool non-hell ponds. The most striking of which was a large and beautiful pool of simmering blue water that was supposed to resemble the sea. We were able to walk up a bit of hill behind the pond to a viewing area where some people offered to take our photo. Apart from the blue pond we also found some smaller, orange pools and another large pond that small children can walk upon in summer using the large and strong lotus flowers growing within. I wished I was a small child! The children were in no danger of boiling, only drowning, as this was a normal non hot spring pool; it even had some fish swimming around inside! Continuing with the garden idea, in one corner of the umi hell we found a small green house. The plants and green house were not amazingly presented though there were few cool looking specimens inside. I especially liked two lily pad types in particular. With the greenhouse and rest of this hell finished we passed through another souvenir shop, and had a bit of a rest outside on some seats with some vended drinks. On to the next circle of hell! This one was called the Oniishibozu Jigoku (鬼石坊主地獄 = demon + rock + priest + chief + ground + jail). As you may glean from the literal translation this hell is named after the grey mud in the ponds that bubbles up to create round bulbs that resemble the shaven heads of Buddist monks. Inside we found the grey mud pools and enjoyed watching the round popping bubbles. Though they did at times look like monk heads, generally they were interesting yet amorphous blobs! I took around two hundred photos in high speed mode trying to get the perfect shot. For every instant the bubbles were round like the monks heads there were many more instances of them popping, forming or displaying some other funky shape. Apart from the colour the mud looked and behaved much like the orange stuff we had seen in the first hell. This Oniishibozu Jigoku was actually one of our favourite hells as it was quite clean and well kept; some of the others had a bit of a rundown sort of vibe to them. It also had a variety of rubber stamp stations scattered around! Finally, in almost direct contradiction to what I had said earlier, this hell had a public bath house which you could enter if you paid an additional 600 yen. I say almost because you’re really not bathing in the actual hells. There were a further three hells located in Kannawa but I really didn’t want to visit two of those since they apparently keep animals in really poor conditions. The worst hell for this is definitely Yama Jigoku which houses a number of large animals, like elephants :(, in tiny bland cages. It was disheartening though that we had actually already paid for the group pass- maybe it would have been better to pay individually so we didn’t indirectly support their operations. Most people don’t seem to have much problem with the Oniyama Jigoku though I couldn’t bring myself to go in as I felt sorry for the poor crocodiles kept there. Despite her qualms Kate went in to have a look while I waited outside. Apart from the crocs, this hell is notable for containing the most powerful hotspring which emits enough steam to pull one and a half train cars. According to Kate the steam was such that she could barely see anything near that pool. The croc ponds were separate that main one and most were apparently not too crowded. Kate did though report that they looked a bit dirty and one was ponds was definitely over populated. It was also pretty run down looking in general. Finally we made our way down to Shiraike Jigoku (白池地獄 = white + pond ++ hell), which is named for its pond of white milky water. As with the crocodile hell, this hell also felt a bit neglected though the featured pond was a nice blue milky colour. Surrounding the pond there was a semi-lush garden, one corner of which contained an aquarium. The aquarium continued with the neglected vibe of the rest through were able to see some exotic fish like Arapima and some piranhas (which only eat dead things). We didn’t hang around for too long as the bus to Shibaseki for the final two hells was due to leave at any moment!!! Well not quite. We had actually rushed a bit too much and arrived at the bus interchange with a fair bit of time to go. While we waited we considered the bus pass we had skipped earlier and went over to the waiting room across the road to investigate. After puzzling for a while at the different routes (we couldn't see any English information) I decided that the ropeway route was included and if we went there in the afternoon we'd save a fair bit of money with the pass. I wasn't completely sure though as the information was sparse and vague. In the end I asked the lady at the counter and when she said it was indeed included our plan for this afternoon was decided! Unfortunately the bus to Shibaseki pulled up outside right as we were handing over our money and the lady still wanted to explain everything about the pass to us- she probably thought we wanted the ropeway bus. We pretty much had to just apologise, grab the passes and run off! So we had no idea what do with our bus pass. It wasn’t too tricky though, it was a day pass and all we had to do to activate it was scratch off a scratchit like panel to reveal today's date. Along with the pass we also received a little book of coupons and discovered that we would've been able to use it to save on the hell pass! This next bus ride was another short one and it dropped us off right outside the final two hells. One of these two hells, the Tatsumaki (竜巻 = dragon + scroll = water spout) Jigoku, is quite different from the others as it's basically just a geyser that erupts around twice every hour for about six to ten minutes. The eruptions are pretty regular so we headed there first to check if one was due and the lady outside told us to come back in around twenty minutes. So instead we headed for the Chi no ike ( 血の池 = blood + 's + pond) Jigoku which is named for obvious reasons (if your blood is orangey red). Like the monk head hell, this place was quite well set up and didn't feel as run down as some of the others. The pond itself was a striking reddy colour and was probably the largest individual pool we’d seen today. While it wasn't bubbling violently the white steam wafting off the surface betrayed its scalding temperature. I can actually tell you that the water was a toasty 78 degrees Celsius thanks to a nearby sign board that also contained a bunch of other facts. 4O4) and ferrous oxide (FexOx). There a few different types of iron oxide (thanks to the various oxidation states of iron) and the name ferrous (Fe2+) oxide actually implies FeO which is pretty rare and black coloured mineral. The red colour of the pool is almost certainly caused by an iron oxide- so this can’t be right. I had a look at the Japanese side and the word is just 酸化鉄 (acid + change + iron), which means iron oxide. I suspect that it's actually much more likely to be ferric oxide (Fe+3) which is Fe2O3 , also known as the red brown mineral hematite. That wasn’t all the sign had to tell us, we also learnt that the flow rate is about 1800 kilo litres a day and the depth of the pond is either 30 metres or 180 metres. The latter is called the "Presumptive Depth" in English. I have no idea what this means. In Japanese the kanji are 実測 (real + measurement) and 推測 (infer + measurement). If you have real measurement, the inferred depth is wrong and your answer is the actual measurement- you can’t claim both. The deepest lake in Japan is 423m deep so 180m seems unbelievable for this little pond. Also dubious, or rather outright crap is the claim that the mud can be used in the treatment of skin diseases. There was a little shop next to the lake selling the mud for this purpose. This is really just part of the pseudoscientific notions that seem to go hand and hand with onsen culture- hot springs purportedly have the power to treat whatever ails you with specific types (acidity, mineral content) claimed to be more effective for certain diseases. Also- don't even get me started on the ridiculous notion in Japan that personality is determined by blood type, including astrology like horoscopes. Beyond the sign board we found some stone steps which we climbed to get another good view down over the blood pond. It was really was quite an intriguing colour, especially with the surrounding greenery. There wasn't really twenty minutes worth of viewing available at this hell but we did our best to use up some time before going over to Tatsumaki Jigoku. The souvenir store here was much classier than the others though we didn't want to look too closely as the shop lady was clearly suffering from a cold. 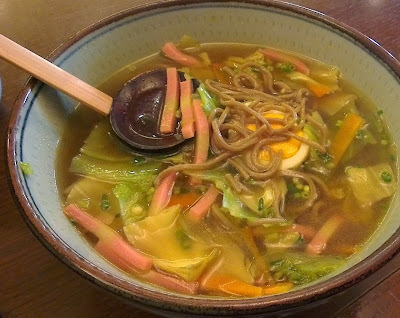 Eventually we decided to leave a little early and went over to wait at Tatsumaki Jigoku. There was ice-cream for sale at this hell and we almost bought some but somehow managed to resist and instead just went and sat at the seating in front of the geyser. As expected, this was a little boring so we got back up again and went to explore the rest of the grounds. A steep path led up through a little garden; after a few minutes returned as there were announcements stating that the eruption was imminent! Many more people had gathered and we quickly made sure to secure a seat. While we waited some people seating next to us spoke to me and I got to practice some Japanese. I can't remember what we talked about though! While we waited the announcements continued telling us to please wait patiently as the eruption was pending. The geyser area was a little wall of rocks behind a muddy pond of water that was roped off. Next to the rock wall there was a sign containing extensive information about the geyser though it was all in Japanese. It said that the water reservoir was located 50 meters below the surface, the water that collects there is heated to a temperature of 150 °C. Once it reaches this temperature it moves up towards the surface via underground cracks and boils as it is ejected into the atmosphere at a cooler 105°C. How does the water reach 150 degrees without boiling? The pressure in the earth’s crust increases at a rate of around 30MPa (megapascal) per kilometre. One MPa is about ten atmospheres worth of pressure. So, at fifty metres down the pressure would be around 1.5MPa. There may be a formula to work out how boiling the boiling point changes with pressure though I just consulted a chart to find that at 1.5MPa, water boils at 200 degrees. Anyway, the sign also talked about some other famous geysers in America (Yellowstone), New Zealand and Iceland and stated that this one was especially notable because of its short recharge period. Quite suddenly the spectacle started! The geyser shot out with a lot of energy and a narrow jet of water burst up towards to sky! Unfortunately it was stopped quite a bit short as there was a stone lid above the jet that restricted the height to about two metres. I guess this is to stop scalding water spraying bystanders though it was a bit disappointing to have it cut off like that. Apparently it would reach a very impressive height of fifty metres were it unleashed. Nevertheless it was still exciting and copious amounts of water and steam were ejected. Everyone’s cameras were out and after a little while people started to get up to move forwards to get a closer look. We could get to about a two meters of the opening which was a plus though we couldn't actually see the hole. Before long everyone was lining up to pose in front of the spout of water and someone even offered to take our picture. The event lasted for around seven minutes which we judged to be a satisfactory amount of time. Once it was finished it was time to go out and catch the bus back to Beppu station (via the Kannawa interchange). The route was a loop from the interchange and it was only just before we arrived that I realised that the bus we were on was going to take a very scenic route to the station! We managed to get off just in time and jump on different, already waiting bus headed to Beppu station. With the crisis averted we arrived at the station before long and looked up the stop and time for the bus to the Kintetsu Beppu Ropeway. 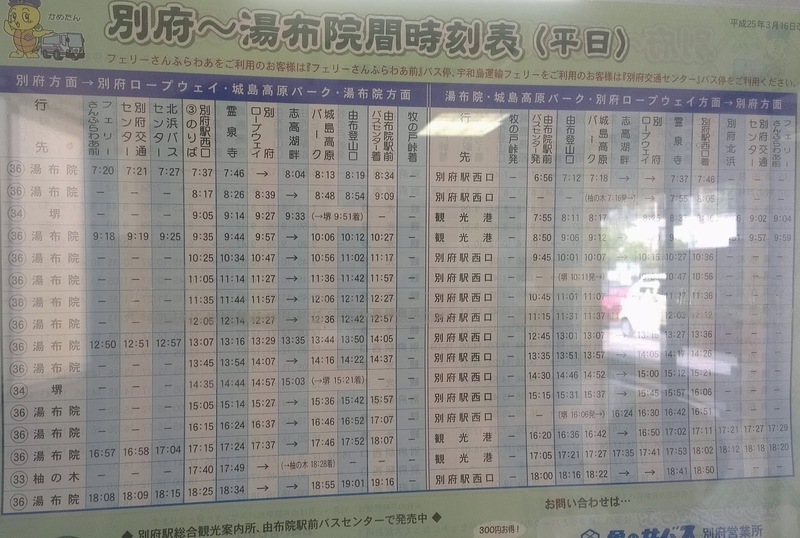 Apart from the timetable, there was also a staff member who confirmed the departure time and stop. We still had a little wait to go so we went into the station and had a look at the convenience store and an ice-cream store. This additional temptation was too much for Kate and she ended up getting a blueberry flavoured (IIRC) ice-cream. The next bus arrived on time and we were soon travelling up the mountain range behind Beppu to the base of Mt.Tsurumi. The road actually leads to Yufuin which was to be our first destination tomorrow in a rental car we had booked for the next few days. I had originally considered doing the ropeway as we drove past though Kate pointed out that we had way too much planned for tomorrow so it would made far more sense to do it today. It was also good catching the bus up first as it let us sus out the first road route we'd be driving along in Japan- we were bit nervous! While we were riding we kept an ear out for our stop Beppu Ropeway ( 別府ロープエウェイ = Beppu Roopuwei) and made sure to push the bell to get off once we heard it. The bus actually pulled all the way in to the ropeway complex anyway so it would be pretty hard to miss. When we got off we made sure to have a look at the timetable since the buses were not terribly frequent. Waiting at the bus stop for a bus back to Beppu were an old Japanese couple who seemed really excited by our presence and said they had met us before! I had no idea where we had met them but pretended to out of instinct. Later we realised it definitely wasn't anyone we had seen today in Beppu! We must have met them in some vastly different part of Japan and perhaps even on our last trip! I wish I had asked where!! Anyway, the ropeway wasn't very crowded and we were able to easily buy tickets (700 yen) and secure seats on the waiting gondola. Before long we began our ascent. The Kintesu Beppu Ropeway climbs Mount Tsurumi (鶴見岳) which is a 1,375m tall active volcano (though it hasn't erupted in quite a while). As we climbed a lady in with us narrated in Japanese. I think she was mainly talking about how the scenery changes with altitude and that at the top we'll be able to see the blooming of many pretty flowers. Along with our tickets we had received an English pamphlet which informed us that from Mid-May to early June we would be able to view the pink Rhododendron flowers. There was information for each of the seasons however winter and spring looks to be the most interesting of the four. During winter it’s possible to view hard rime from the summit, which is actually the mountains main claim to fame. Apart from the Rhododendron flowers, spring is also home to the blooming of over two thousand cherry blossom trees at the base of the mountain. The vegetation on the way up mainly consisted of thick forest, which shortened and thinned out as we neared the top. Right before the upper ropeway station we saw some of the pink flowers we had heard about!! After alighting we found a viewing platform that looked over a large amount of the plants. They were not quite in full bloom yet but still looked very pretty! Around the top of the mountain there was a fair amount to explore and after consulting a map we agreed to go on a little tour of the various walking trains up to the summit and back. The first major attraction on the paths was a little viewing platform, unfortunately it was pretty hazy down below so we couldn't see too much though it was still an interesting view. We could see back down to the ropeway station! The various paths also past a number of different statues and we made sure to visit each one! Rhododendron and various other flowers were blooming up around and along the paths which actually attracted quite a large amount of bugs. Eventually we reached the peak and were rewarded with an even denser swarm of critters! A large post informed us that we had reached an elevation of 1375m! From the summit there were a couple of paths that led out to further (less high) peaks however there were signs stating that you had to be an experienced and prepared mountain climber to attempt those walks. The view from up here was similar to the one at the viewing platform in that we couldn’t really see much apart from cloud and haze. We could see one mountain in the distance that perhaps looked a bit active, though were couldn't be sure. Finally, there were also some communications towers up here! After consulting the bus time tables we realised we'd better head back down; we still made sure to decent using a different path so we could visit the statues we had missed earlier. Back near the ropeway station there were few things of note such as a shrine and a giant thermometer. Kate hilariously thought that the thermometer was filled up with liquid though it was actually just coloured bits of plastic that would flip to display white or red as required. Once the next gondola was due to depart we made our way over and once again secured a seat. We didn't actually have to worry at all though as it turned out we were the only ones riding it down! Well, apart from the gondola attendant who didn't say anything despite his microphone. I'm not sure if that's because there was nothing to say or it was because he assumed we didn't understand Japanese. Upon reaching the bottom we used the remaining time before the bus was due to have a look at nearby plant/flower shop. We also bought some delicious pink chewy lollies from the ropeway's souvenir shop. Our bus back to Beppu showed up right on time and we settled in for the return journey. As we came back into town we spotted Beppu tower and considered getting off at the next stop to go and have a look. We ultimately decided not to as it was still pretty hazy, instead Kate tried her best to snap a photo of the tower from the bus. By the time we arrived it was around 04:30pm- close enough to dinner time for us! We had a look around the station and found some food in a little restaurant that was open but still empty. I ordered some assorted tempura, miso and rice while Kate consumed this delicious curry flavoured noodle dish. After dinner we had another look around the station and I ended up buying some fireworks from a Family Mart convenience store! There were a large variety in the pack and we were not actually sure where we could use them. We really wanted to know if it would be ok to just light them up in a park or the side of the road? As mentioned, our hotel was near the ocean and since we'd seen people light fireworks on beaches before in Japanese TV shows we thought that would be an ideal place. Unfortunately, once we made our way down to the ocean we found that there was no beach there at all! Just a bank of sand and a little moat of water! The actual ocean water beyond the moat looked pretty nice though and we could even see a few sail boats blowing around in the wind. It actually wasn't even dark just yet so we decided to leave the fireworks for now and have a crack another day. To end the day we walked back to our hotel and prepared for tomorrows trip along Yamanami Highway! Also known as the trans-Kyūshū route, this highway would take us right across the island to Kumamoto. Although it's possible to do via bus, we decided to take the much more flexible rental car option which we were due to pick up tomorrow. It will be our first time driving in Japan so we were a little nervous! 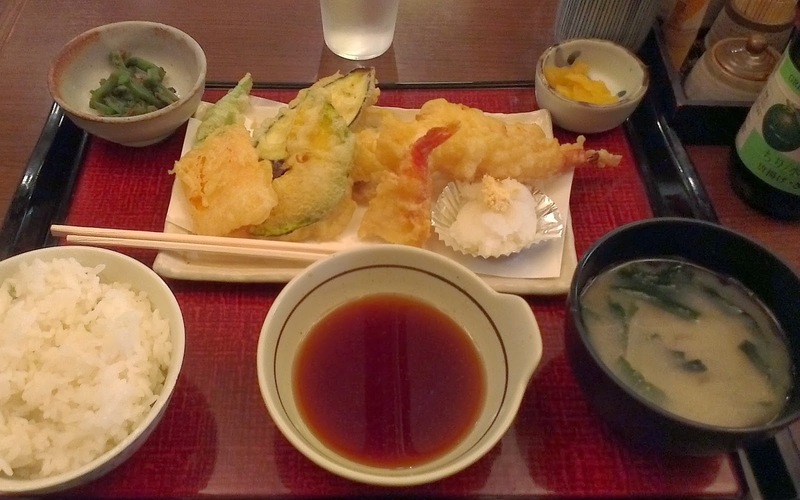 We'd spend the next few days on the route and the plan for tomorrow was to visit the idyllic hot spring town of Yufuin in the morning and then continue on to the famous Kujū Mountain where we'd do as much hiking as possible before we were due at that nights ryokan hotel in Tsuetate. Or, are you considering visiting or have you recently travelled to Beppu? I'll be glad to answer any questions you may have! I have benefited from reading your blog. I am planning a day trip to Beppu to visit Umi-jigoku and Chinoike-jigoku. May I ask if it is possible to walk from JR Beppudaigaku station to Umi-jigoku? Possible to walk from JR Kamegawa station to Chinoike-jigoku? At JR Beppu station, are there shops with vending machines which we can choose the food (Beppu ramen), slot in the money to collect a ticket before passing it to the shop? Although it's possible, that's quite a hike! From Kamegawa to Chinoike-Jigoku it's 2km each way, so another 4km for a total of 10km. That seems like a lot of walking for one day! I definitely think the bus from Beppu station would be best though. As for vending machine shops... I had a look but I couldn't find anything. Generally it wouldn't be something that would be easy to find on the internet though so that doesn't mean that there would not be one. I guess you'll just have to wait and see! Thank you very much again for leaving a comment! Hi! Very detailed report! Thank you! I am from Canada and planning to go to Beppu next month and we will stay there for 3 nights. We have a 1 and 3 years old boy with us so we want to take is easy and bath as much as possible. So I thought we would stay in the Kannawa area near the jigoku so we can just walk around without having to take the bus too often with our babies. Can I ask if you think it would be a good idea to stay at a ryokan in this area instead of a hotel next to the sea? Yes! I think that sounds much better actually than staying by the sea. Many of hotels near the ocean are not that nice anyway- Beppu is all about the hot springs, not the ocean. I'm sure you'll have a great trip!